Add to it that crazy summer camp sign-up line on Monday that's all the way to the door. Apparently this only happens at our school. Everyone else still has spots, so if you're one of the families that are on the waitlist, check out the forms here. Our principal was surprised to hear about the line. "Why no on-line sign-up?" Good question. In case you're wondering too, the community schools had a committee to look at solutions, and after a year they couldn't decide, due to equity and privacy concerns. If things like this feels like they should be solvable, regarding our public schools, then you should come to the Cambridge Parent Summit that a group of us diverse parents are organizing for May 12th. You can come for an hour or for the whole day and we'll have lunch and childcare. We are all about parent voice and taking actions. Vote for topics on your mind and hear from other parents! Sorry, back to solo parenting. I'll spare you the daily raising my voice at the kids, and just give you the high (and not so high) lights. My lowest point: last Saturday when I took kids to the park, I fell and landed hard on my back, and couldn't get up and just lay on the ground. My stream of consciousness: "Geez, what if I get hurt? Too bad my inlaws (who live nearby) were also traveling. I'd need to ask friends for help. Good at least I have the phone. Maybe the kids can ride with me to the ER if I call 911." My kids didn't know what to do. Fortunately a kind passer-by came by to check on me. And I struggled a bit but got up after a few minutes. I sat and waited, and felt better physically. But still wondered, what if I hit my head and pass out, would my kids know what to do? In case you're wondering how these came about, some cases I just mention to friends I'm on my own, others I wrote and asked if they wouldn't mind having my kids over. People are so willing to help! 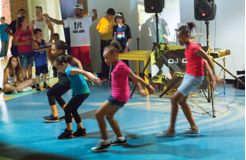 Join us for our monthly family dance party, Kids Jam. Live DJ. Dance lessons. Games. Free dance. 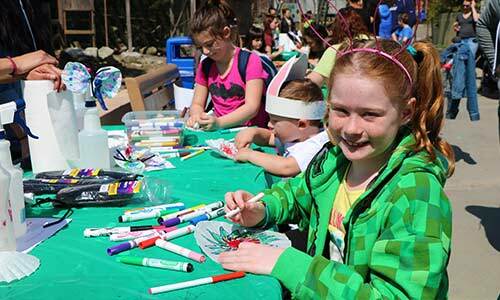 Easter Crafts at King's Chapel Parish House! Egg hunt "Save Sleeplessland: mission Easter Bunny"